There are only two Whisky Boys round at Jim’s house for this tasting on the evening of Tuesday 26th January, Dougie due to work commitments was sadly missed on this tasting night. So Jim and Nicola were left to open and savour the joys of an island malt from the Tobermory Distillery on the Island of Mull. It is a 10 year old malt simply called Tobermory. Tobermory Distillery is the only distillery on the Isle of Mull, lying off the west coast of Scotland. Tobermory is the capital of Mull and lies towards the northern end of the island. The bay is one of the safest anchorages in the Hebrides, indeed the original name for the area was Ledaig (pronounced Led-chig) from the Gaelic, meaning “safe haven”. The name “Tobermory” was derived from the Gaelic “Tobar Mhoire”, which means “Well of Mary”, and relates to the well and chapel of St. Mary. Nose…Sweet ginger spice and peat putting it’s nose in a little. 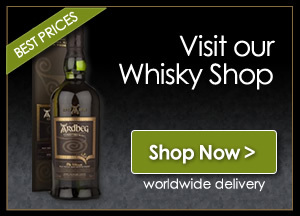 Taste…A little oily with a Dry/creamy sweetness, no effort is required to drink this wee dram. Finnish…Smooth and dry with a little smoky/peat at the edge with not too long a finis. Nose…Nutty, smooth aroma with a hint of vanilla. Taste…Burnt nuts, smooth with some spicy notes. Finish…Smooth with a medium finish, a little spicy tingle remaining on the tongue. A grand wee dram is this Tobermory not quite up to Islay standards, but for Jim, nothing does beat an Islay. We both agreed that this dram is far more palatable and pleasant than its brother Ledaig, When Nicola calls round her first choice from the Whisky cabinet is usually a Bunnahabhain 12 Year Old but her second choice would be this Tobermory 10 year old. 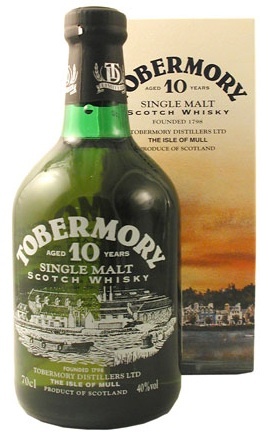 Since the tasting Jim has enjoyed his late evening dram being this 10 year old Tobermory, this nip certainly grows on you and we would recommend that all our readers obtain a bottle and sit back and enjoy, you will not be disappointed.